Glaciers and ice caps reached their Holocene (the past 10 000 years) maximum extent in most mountain ranges throughout the world towards the end of the Little Ice Age, between the 17th and mid-19th century. Over the past hundred years a trend of dramatic shrinking is apparent over the entire globe, especially at lower elevations and latitudes. Within this general trend, strong glacier retreat is observed in the 1930s and 1940s, followed by static conditions around the 1970s and by increasing rates of glacier wasting after the mid 1980s. There are short-term regional deviations from this general trend and intermittent re-advances of glaciers in various mountain ranges occurred at different times. 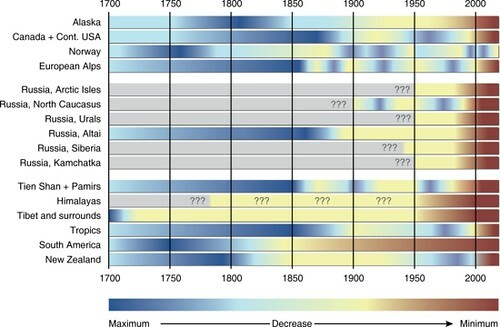 The trend of worldwide glacier shrinking since the end of the Little Ice Age is consistent with the increase in global mean air temperature. The decline in solar radiation at the Earth’s surface (global dimming) in the second half of the 20th century and the transition from decreasing to increasing solar radiation in the late 1980s may be due to the industrial pollution of the atmosphere and the more effective clean-air regulations together with the decline in the economy in Eastern European countries, respectively. This might explain some of the glacier mass gains around the 1970s and the subsequent strong mass losses. 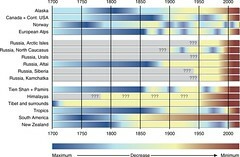 Significantly increased precipitation has been linked to the advance of glaciers on the west coast of New Zealand and Norway in the 1990s and can give valuable insight into regional climate oscillations such as the El Niño/Southern Oscillation or the North Atlantic Oscillation.